If you don't have the time or money to head out and treat yourself to a pampering session at the day spa, then Sanctuary Spa has got you covered with their Brightening Facial In-A-Box (A$30)! Brightening Facial In-A-Box is a 30-minute step by step pampering treatment to enhance your skin for a radiant and bright glow all in the comfort of your own home. 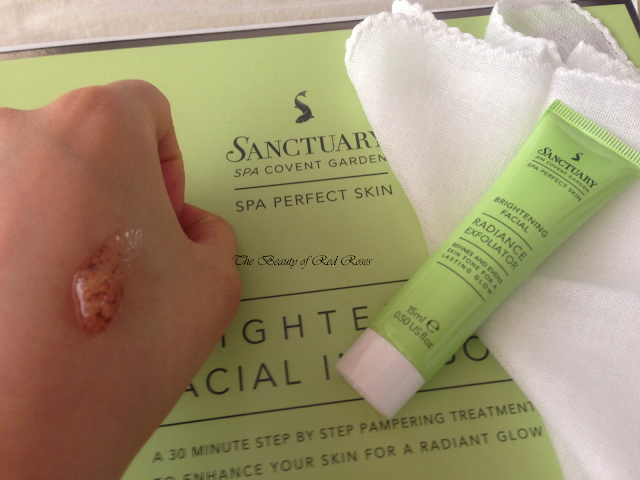 The Sanctuary Spa Brightening Facial In-A-Box contains a Polishing Hot Cloth Cleanser (15ml), Muslin Cloth, Radiance Exfoliator (15ml), Moisture Boosting Mask (15ml), Brightening Eye Gel (5ml) and Illuminating Moisture Lotion SPF15 (15ml). For a quick and simple pick-me-up to boost your skin's radiance for a special day, start with a deep cleanse using the Polishing Hot Cloth Cleanser and muslin cloth. Submerge the muslin cloth in warm water, wring out and lay the cloth over your face so that the heat from the cloth helps to open the pores. Then, use the creamy Polishing Hot Cloth Cleanser which has a subtle coconut aroma to gently massage the skin. The cleanser contains Cocoa seed butter, Jojoba seed oil, Coconut oil and Chamomilla flower extract to soothe and hydrate the skin whilst you cleanse your skin. Use the muslin cloth to polish the cleanser on your skin in circular motions and then splash the skin with water. Before the exfoliation step, submerge the muslin cloth in cold water and lay it over your skin to close the pores. Exfoliate the skin using the Radiance Exfoliator which contains Grape seed powder, Lemon peel oil Papaya fruit extract and Pineapple fruit extract, a wonderful concoction which has a divine citrus scent! I only need to use a small pea size amount to gently massage onto the skin in circular motions for about 30 seconds - ensure you exfoliate and focus on the forehead, nose and chin. The tiny grains are combined into a transparent gel formula which helps to exfoliate the skin for a smoother and brighter surface. Rinse the skin using lukewarm water and then pat dry. The Moisture Boosting Mask is a once or twice a week treatment which helps to boost the skins moisture and radiance. Apply a thin layer of the mask onto dry skin and relax for 10 to 15 minutes. Use a warm damp cloth to wipe away the mask. My face feels very cooled, smooth and fresh and there were no signs of my skin feeling tight nor dry. The delicate skin around the eyes should be well hydrated to ensure your eyes are far from becoming dry and looking dull. The Brightening Eye Gel is a quick absorbing and hydrating gel which helps to relax and moisturise the area around my eyes. I always keep this little beauty in the fridge, so that when it comes to applying the gel to my eye area, my skin feels really great and refreshed! The last step of the Brightening facial is to hydrate and protect the skin using the Illuminating Moisture Lotion SPF15. The lightweight opaque creamy formula hydrates my skin very well and i love how fast absorbing this cream is. It also contains SPF15 which helps to protect the skin from UVA and UVB damage from the sun rays. Overall, Sanctuary Spa Brightening Facial In-A-Box is a lovely pampering kit which boosts my skin complexion making it feel refreshed, revived and radiant! I especially love the use of the muslin cloth which made my skin feel ultra smooth as well as using both the Radiance Exfoliator and Moisture Boosting Mask which made my skin feel and look amazing! As we are heading towards Christmas, this Brightening Facial In-A-Box would be an excellent Christmas gift! 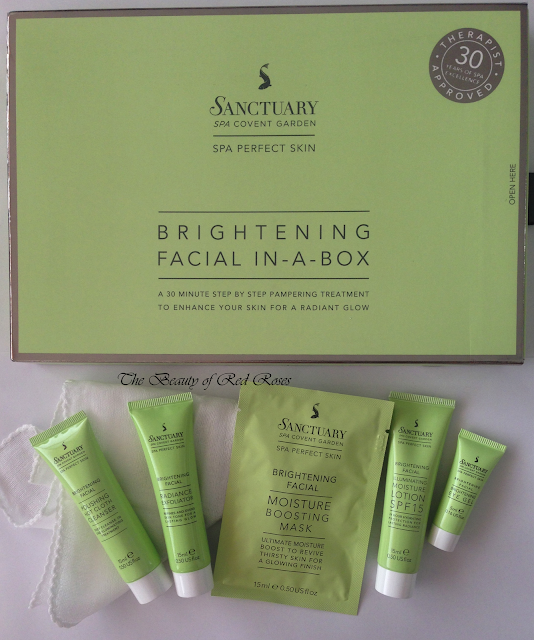 Sanctuary Spa Brightening Facial In-A-Box is available now at Priceline stores nationally. Do you prefer going to the day spa for a pampering session or prefer a quick and easy pampering session at home? Products were provided for consideration only. This review is 100% based on my own thoughts and opinions. 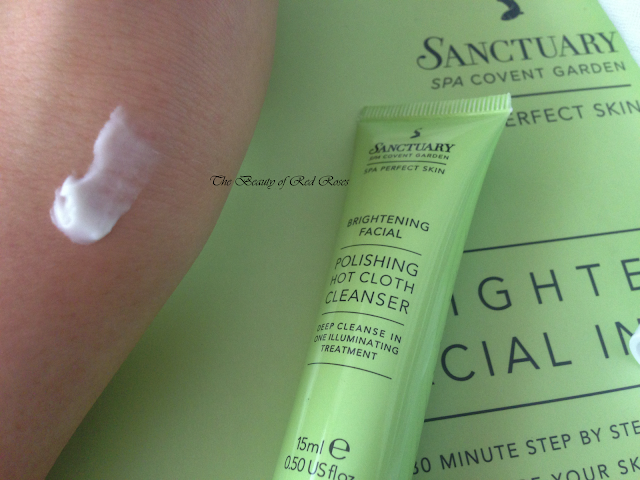 I am not affiliated with The Sanctuary Spa and did not receive remuneration to post this product review.